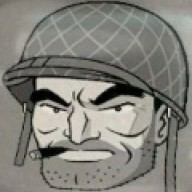 Discussion in 'Fallout General Modding' started by SorgFall, Aug 15, 2007. Ha. Cheaters everywhere. My point is, there is no "official" way to enter BOS bunker without completing Initiate quest first. And BOS members do not recognize you as an intruder, because there is no code in their scripts or text in their dialogues related to this situation. So the simpliest way to fix this inconsistence is to close all the "cheaters" ways. Is it possible to add the code? or is that too much work. BTW, te people should treat you as hostile if you kill the gaurd silently to. I mean, they have to have like, idk, an intercomunication com system thingamajig right? Just make it so that if you enter the bunker without compleating the quest in question. on more question, if you kill everyone inside the bunker then kill the gaurds on the outside, does the door lock? That is kinda why i want the door pickable, I like that base so much, i have to have it for my self. great place for storing all that hard earned money and weapons. Is it possible to add the code? or is that too much work. It would go beyond a basic bugfix. Except if you only made all of them attack on sight, I guess. You can unlock the door if guards are dead. Of course, if you killed guards, all BOS members will attack you. Inconsistence stays if you "executed" guards with dynamite or superstimpack. It can be fixed if guards will attack you after you tried to use smth. on them. The problem, it seems to me, is that Zimmerman is set to join the Regulators and turn hostile if you attack them, but he does this even if you've showed him the holodisk (which changes him from his original indecisive team to the team of the townspeople). Once you show him the holodisk he shouldn't change again. There is no way for Zimmerman to stay alive. I don't believe this is some kind of a bug. There is no options in Zimmerman's dialogue after solving his quest, so it seems like he isn't supposed to stay alive. So instead of giving players an opportunity to save him, we took away (in 1.3.4 patch) a possibility to use superstimpack (or any other item) on Regulators guarding him. So either he switches his team correctly or not is not relevant: if you told him the truth about Regulators he will be dead and if you didn't he'll be hostile towards you. There was a bug reported to our forum. One lad is playing Fo1 with unofficial patch 1.3.4 from TeamX. He is blackmailing Bob but he is now far above maximum amount of $250 and he can still rise the bottle caps up. As far I know there was a change in the script against official patch version. But I don't know what was changed. List of changes say nothing. There is no ceiling in the official script. You can just keep increasing it. There is no way for Zimmerman to stay alive. There is, even without Super Stimpaks. 2Per I simply meant he isn't supposed to stay alive. Skynet Where'd That 6th Toe Come From? Two bugs. Using Fallout 1 unofficial patch 1.3.4 with Npc mod 3.4. 1. (Junktown) After the cutscene in bar where Neil shoots gangmember, I talked to Trish. Choosing the "Actually, I have some questions" option will exit the dialog. 2. I talked to the Aradesh for the first time, offended him a little, then made apology and accepted to help with radscorpion problem. After killing radscorpions I tried to talk to him again, but he won't talk to me (info screen says he is too furious). Even after rescuing Tandi will not change his behaviour. 3. (The Glow) If you ask Zax "Who programmed you?" the dialog will exit. Quite obvious bugs but they are quite boring:you cannot save Nicole and followers of apoacalypse in The boneyard. Always in the boneyard:if you manage to give the holodisk to the mayor and manage to save him,after the fight ,he says nothing and may also become hostile. The hub:You cannot get the end where Harold saves the city. Some crashes in some fights in the Church,at the first or second level,when i was wearing the monk clothes. The famous crash that happens if you use a bomb/dynamite and save just after. Morticia Look, Ma! Two Heads! I know about the infamous, planting dynamite crash. That is well known, I imagine. 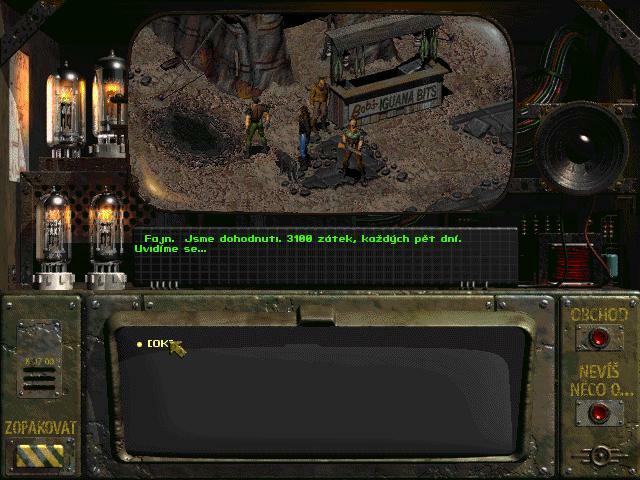 Others I think just happen now and then, and like with Fallout2, it just makes the game more interesting. Ever played through Baldur's Gate? Black Isle made those quests perfect and predictable, but F2 is always sort of random, and that's what makes it horrible for modding and great for playing. 2jupiter2 Missed ending can't be considered a bug. And in patches we fix bugs and bugs only. However, we will restore both in Restoration Project. Have you read this topic before posting? The answer is right above you: "he isn't supposed to stay alive". So instead of giving players an opportunity to save him, we took away (in 1.3.4 patch) a possibility to use superstimpack (or any other item) on Regulators guarding him. Btw, the bugs I posted on Jul 05....I had my IN 5. I did read the fact that he was note supposed to stay alive,but i was wondering if it would be hard to add scripts so as you can save . Thanks for restoring the missed endings if you do this i will really thank you. 2jupiter2 Not in patch. Patch is supposed to fix bugs, not bring in game any modifications, regardless of number of people, who wants them. But for mod it is a good idea. Here are some new fixes. For now as a fix-pack. I'll make a new release after some more testing. * Water thief's animation sequince no longer resets after save/load. * Now Aradesh correctly reacts to player's apologies (his dialogue reaction goes up). * Restored the original developers idea of Aradesh reaction to pickpocketing: now he doesn't attack player, only warns him and lowers his dialogue reaction. * Tycho no longer "forgets" character's name. * Now Neal correctly opens Skum Pitt door. * Now Neal reacts if player tries to mess with the Skum Pitt door. * Option "Actually, can I ask you some questions?" in Trish dialog removed for characters with IN 5, because all of the next options require IN 6. * Trish no longer asks player to get out of her room while she is in Skum Pitt. * Now cops correctly address male and female characters. * Now you correctly receive 25XP for picking the lock to room with imprisoned ghoul in Watershed. * Now you can provoke Abel to lover the force fields. * Abel now has correctly working Field Switch in his inventory. * Mutants no longer attack unprovoked after save/load. * IN<=5: if you ask Zax "Who programmed you?" dialog will no longer exit unexpectedly. * Now Patrick the Celt correctly marks Hub on map. * Now you can't pick the locks of certain doors for infinite XP. Note: you can use your old saved games if they were made before military Base. PS About 7z archives: www.7-zip.org. Just in case. BTW, here is no armor option for F1 NPC Mod. Everything stays the same except for NPC's appearance: it doesn't change with the armor. So if I understand well I have to install NPC mod first and if I don't want to my NPC change armor, have to install this. Those protos are original files? Is it not better to make two files like NPC mod with armor and NPC mod without armor?